Squarebills are a staple for any shallow-water bass angler. They're essentially the four-wheel drive crankbait option; they deflect off of cover very well and their aggressive wobbling actions can be especially effective in stained water. From beginners to experienced veterans, these types of crankbaits catch a bunch of fish throughout the entire country. I've been hearing a lot of chatter about the Rapala BX Brat squarebill lately, so I ordered some and started putting them to the test. The crankbait bite is about as good as it'll be in my area this year, so this has been a perfect time to see if this plug lives up to all of the hype. I've learned a lot about this particular model and in the next few slides, I'll explain what makes it different from all of the others. It's made from balsa wood... kind of. 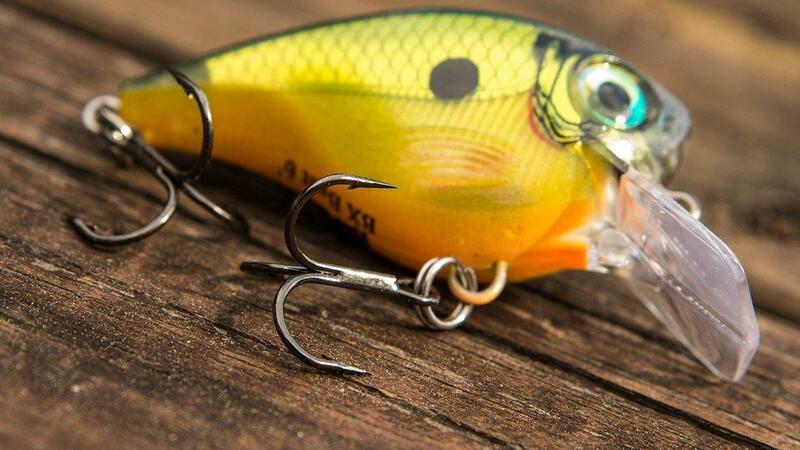 Balsa crankbaits are a major staple for most shallow-water guys, but they have one major drawback: They're not very durable. Even if you slap a balsa plug on the surface to quickly remove a leaf or vegetation, the body will often crack which renders it ineffective. For a squarebill that's designed to collide with cover, durability is a major concern for most anglers. The Rapala BX Brat is constructed with a balsa inner core but it also has a tough, copolymer shell on the exterior. This was designed to give anglers the buoyancy and deflection properties of balsa, but the durability of a plastic crankbait. After beating the tar out of this crankbait for the better part of three weeks, I can certainly vouch for its durability. I've hit it off of seawalls, docks and plenty of rocks with only surface scratches to show. The body and bill of the lure remain perfectly intact and there are no cracks or splits to be found. It's going to get banged up and it will still show minor hook rash and teeth marks after extended use, but I've experienced no damage that will affect its ability to catch bass. I was actually pretty surprised by the size of this crankbait when I received my order. Both models, the 03 and the 06, measure just two inches long. You might think that I was disappointed, but personally speaking, I actually prefer smaller crankbaits. The bass in my local lakes get hammered with fishing pressure all year long and I know they see hundreds of generic squarebills every weekend. I'm a firm believer that smaller crankbaits catch larger fish in my area, so I was jazzed up when I saw the true size of the BX Brat. Both models still weight 3/8-ounce, however, which makes castability a non-issue. Initially, I was a little concerned that they might not cast as well as I'd like, but that hasn't been a problem thus far. When fishing in winds up to 5 to 10 mph, the weight of the BX Brat loads your rod well enough on the back cast to facilitate accurate casts to isolated pieces of cover. Its smaller size also makes a very subtle splash upon landing in the water, which I've really liked. It's not an obtrusive presentation whatsoever. I have also fished this crankbait in some really stiff winds (up to 30 mph) and as you could guess, it didn't go very well; but I'd like to see a crankbait that could handle that type of wind. If you're fishing in winds under 10 to 12 mph, I don't think you'll have an issue with the BX Brat's castability. The BX Brat comes standard with some seriously sharp VMC trebles. I've caught several fish on the outside of the mouth and I don't believe it would have been possible without those sharp stock hooks. It's worth noting, however, that the hooks are quite small. Both models are equipped with No. 6 trebles which look a bit undersized for the body. Fortunately, I haven't had any major issues with my hookup ratio yet. On my next few fishing trips, I may try to put a size or two larger trebles on this crankbait. I'm not sure how it will affect the buoyancy of it, though. I've used three BX Brats straight from the package and each one has run straight as an arrow. You'll notice a fairly aggressive hunting action throughout the retrieve, but it always returns to the center line quickly. Since testing this crankbait, I have not had to tune it a single time; even after some pretty nasty collisions and errant casts in high winds. 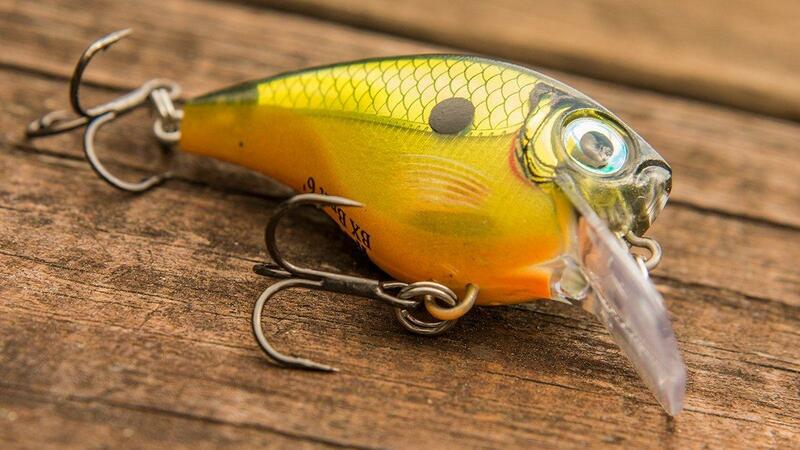 The wobble of this crankbait is more like a "wiggle", thanks to its flat sides. It still flashes hard though, which helps showcase some of the flash foil elements of the color schemes. 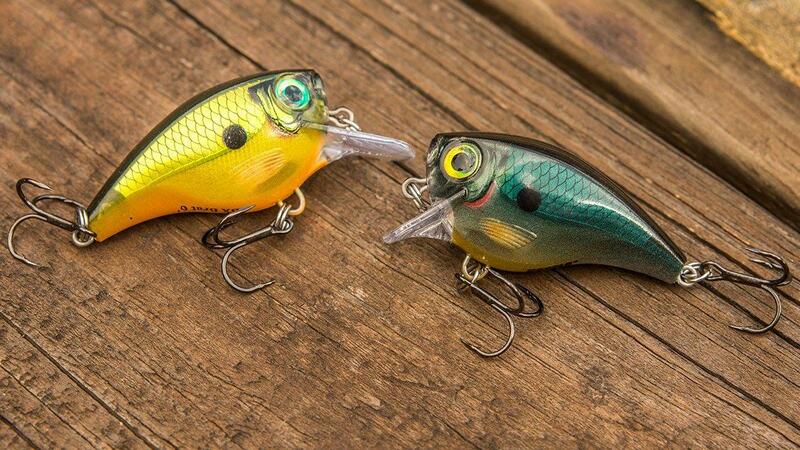 I've become pretty disenchanted with a lot of the crankbait color schemes on the market. Most of them are super generic, which I understand when trying to appeal to a large customer base, but sometimes it feels like you can't ever find that "special" color... because everyone owns it. The BX Brat, however, comes in 12 colors and several of them are unique. Of course, you'll find the staple shad and crawfish-type colors, but I've really taken a liking to a few colors in particular: Carbon, Haymaker, Bone Craw and Homer's Buddy. I think the Carbon color is going to be a sleeping giant for those who routinely fish clear water. You can run it beside your boat and it almost disappears, which will give anglers a great opportunity to power fish in some new, clearer areas. I like the Homer's Buddy color as well, but its sides aren't as bright as I expected them to be. It still has a hard contrast and good flash, but it'd be great to see a more opaque chartreuse/black back combination for fishing the mud. As it currently looks, it has still been a big producer for me in moderately stained water. 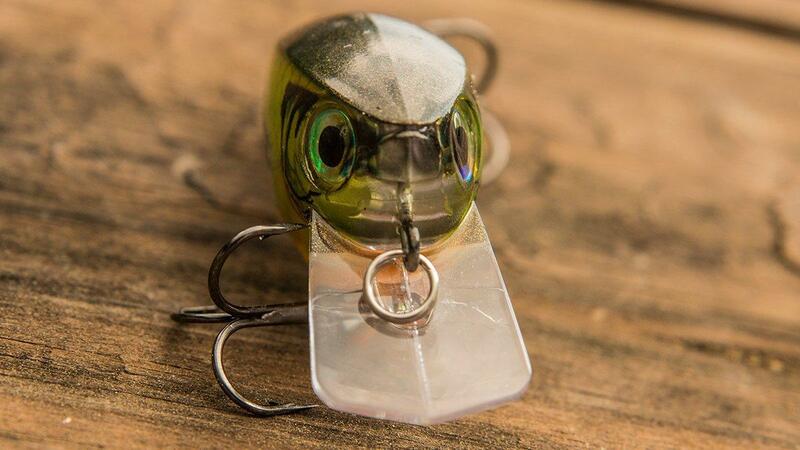 If you're targeting pressured fish on lakes that get hammered by other anglers, I think you'll quickly develop an appreciation for this crankbait. 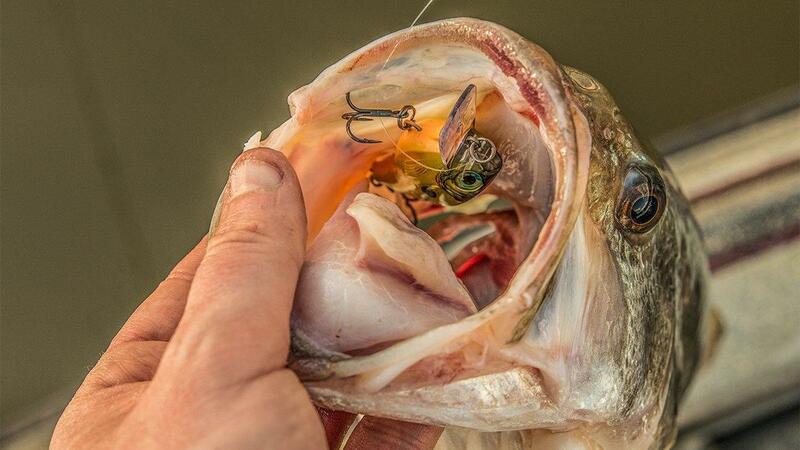 It's durable, it's buoyant and most importantly, it'll catch a lot of those skittish bass. The Rapala BX Brat is available at TackleWarehouse.com.